Our Cycling Geelong volunteers for Sunday’s Elite Men’s Road Race. Robert reports that his first placement was along Boundary Road before moving to be a field-of-play marshal at Queen’s Park Bridge. His role was to wave a flag directing the cyclists onto the bridge. You may have seen him on TV! 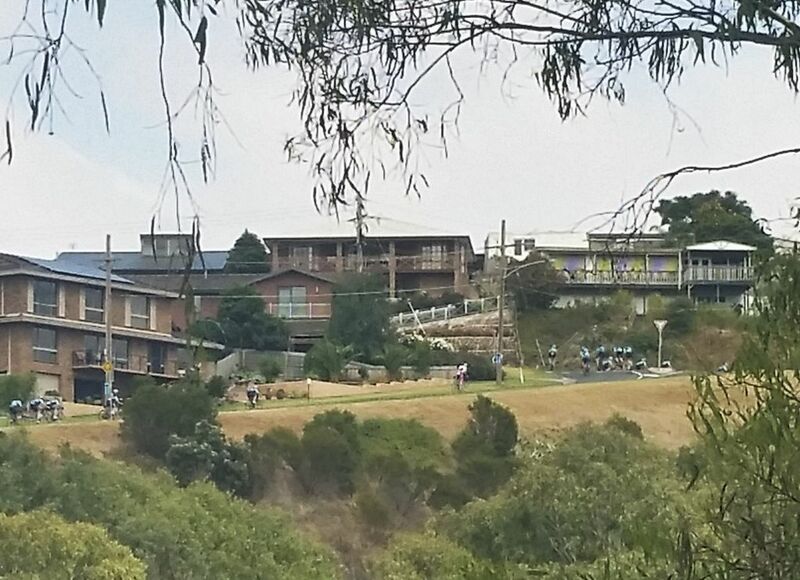 Charlotte was at Barwon Heads. 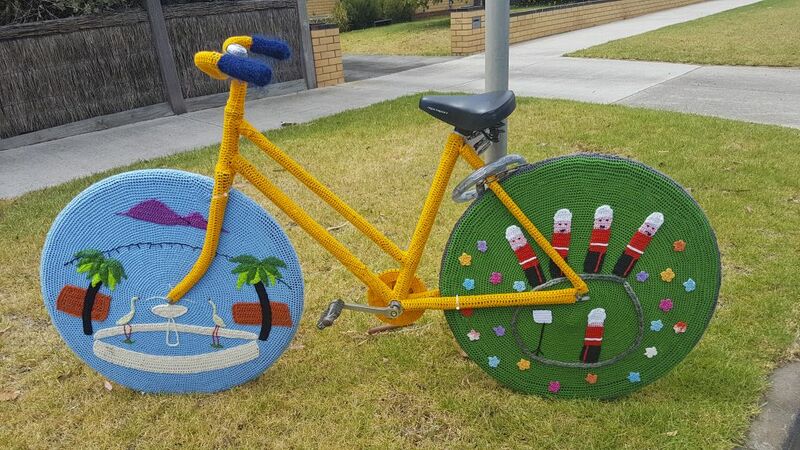 Richard volunteered on Sunday 20th and Saturday and spotted this crocheted bike along the course. Another of Fiona’s creations? 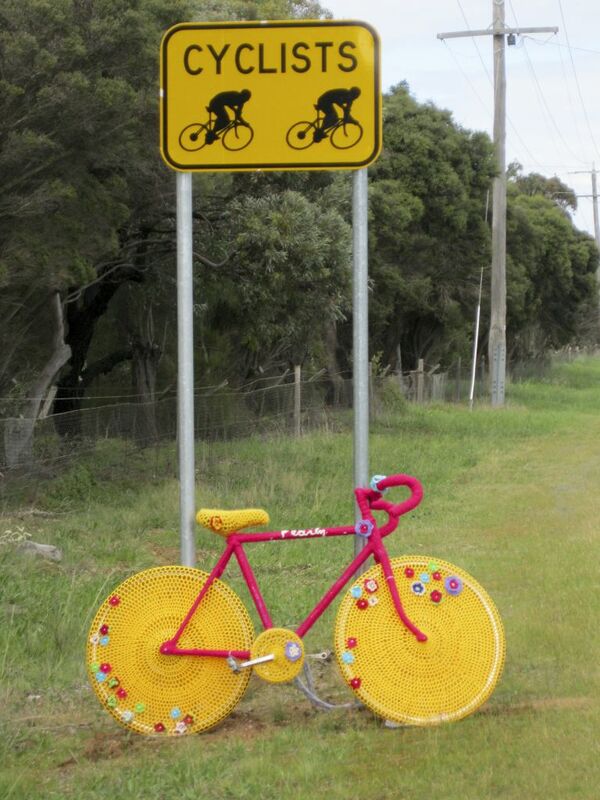 “Pearly” spotted near Lara in September 2010, before she popped up around the course at the World Championships held in Geelong. Alex led 20+ cyclists on the circuit. We had two new riders – Roman and his daughter Lily. 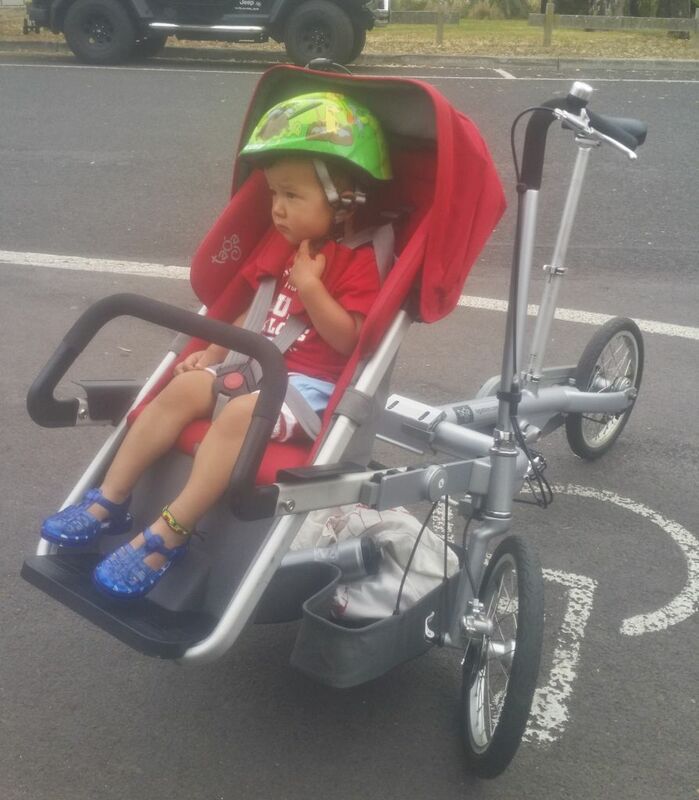 Lily is probably our youngest rider ever and did the ride from the comfort of dad’s small-wheeled trike, which converts into a stroller. There was a rowing regatta so a dismount was needed near Moorabool Street. Otherwise, the path as reasonably quiet. The ride strung out with lots of gaps to allow other path users plenty of space. 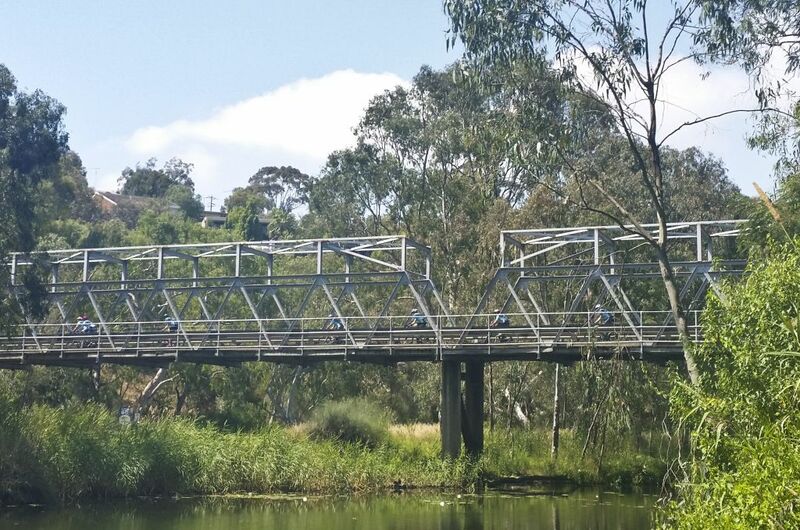 Passing under the Queen’s Park Bridge, the first bunch of Cadel Evans People’s riders came through. David estimated that, to have made this point before 10am, these riders must have averaged around 40kph. They were riding very strongly and looked as if the Aphrasia climb and Melville Avenue ‘wall’ would be no problem. As usual, the coffee break was at Barwon Edge. While sitting there, resting and enjoying refreshments, it was enjoyable to watch the later people’s riders on the lower slopes of the Challambra climb on the other side of the river. By this time (around 11am), it was the average recreational cyclists making the climb. The distance and hills were beginning to take their toll on some riders. Thanks to Alex for leading this most enjoyable ride. On my ride back home, I enjoyed a spin down Church Street. There were still riders completing the Cadel Evans People’s Ride 110km course at that time (around 12am). Later, after watching the women’s event live, I cruised down to Steampacket Gardens for the presentations. With the roads still closed to motor traffic, it was an easy quiet ride. 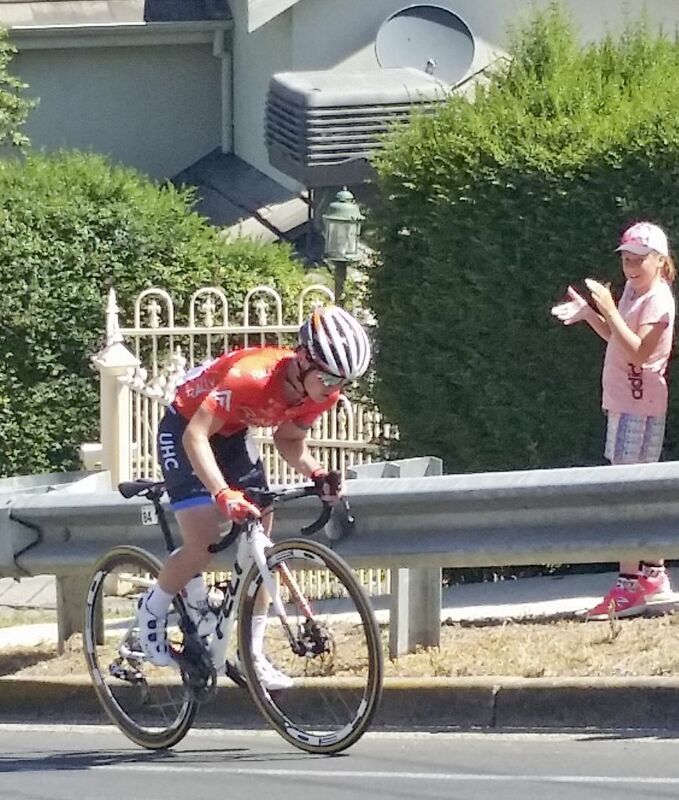 Congratulations to Chloe Hoskins (who also won the Tour Down Under last week). Chloe also won the sprint jersey. Congratulations also to the other place getters, Gracie Elvin (2nd) and Georgia Bronzini, and to Katrin Garfoot (Queen of the Mountains), and Sabrina Stultiens who staged an amazing breakaway on the Chalambra climb and was only caught in the last few hundred metres along the waterfront. Thanks to Geoff for these photos of his experiences. Follow the link to read a message from Cadel following the first CEGORRR. Thanks to Joy Barnett for sending in this report. 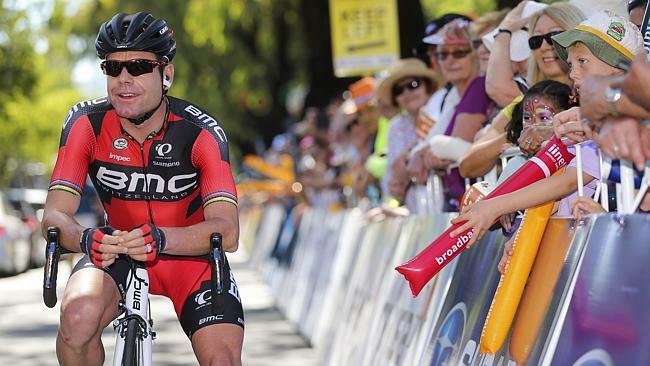 CADEL EVANS GREAT OCEAN BIKE RIDE – what an exciting day on Sunday 1st February, 2015. I volunteered on the workforce and was placed at Eastern Beach where the Race started and finished. 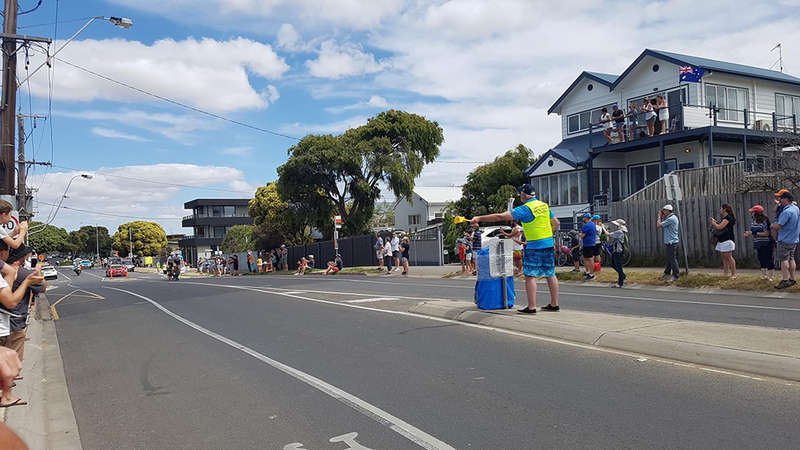 Many people from around Australia came to see Cadel ride his last race on his home ground, and one couple flew in Saturday from Perth, WA to see Cadel ride, and they caught the plane home Sunday night after the Race. 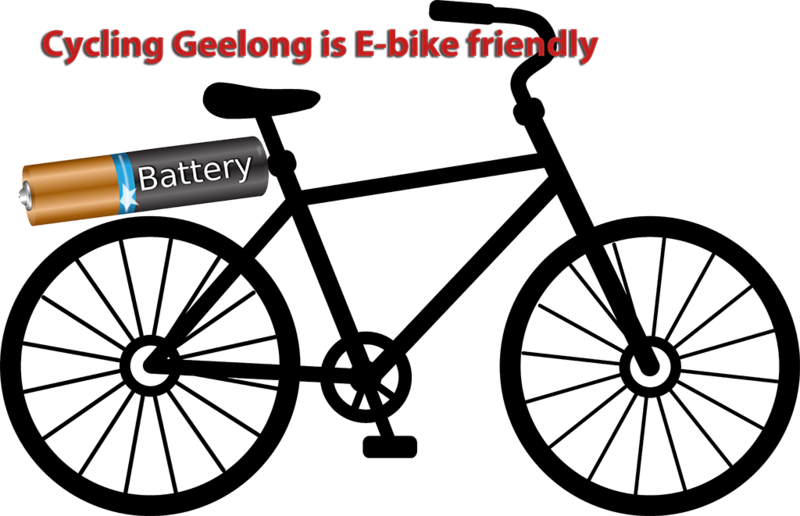 Hence the excitement, buzz and anticipation of this race in Geelong and the Great Ocean Road to see and support Cadel in his retirement from racing. Approximately there where 75,000 spectators, all very excited. The viewing of the large screen as we watched every part of the ride helped make us feel part of their journey 174 kls in drizzling rain. I am so looking forward to this ride becoming an annual event and God willing would like to ride in the People’s short ride 65 ks next year! Thanks Joy for your report, and your support of this ride. 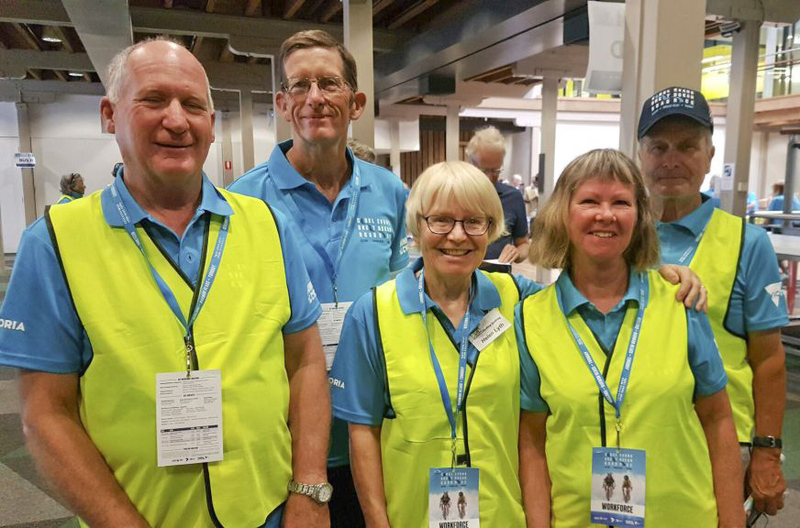 Without volunteers, it would be impossible to run major cycling events like this.